A reality show that's fake?? SAY IT ISN'T SO! Word is that MasterChef Junior starring the lovely Gordon Ramsay isn't all that it appears to be. A lot of people behind the scenes are coming forward to explain that the show is a bit more scripted than what the audience believes. Not to mention, these kids are definitely getting some help from proper chefs. That doesn't mean that some of the kids on the show aren't aspiring chefs, but they still have a ways to go. 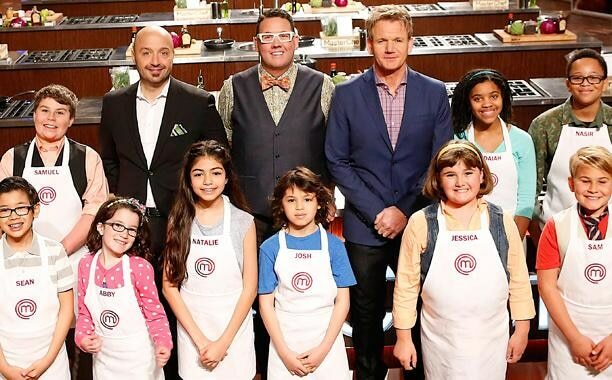 MasterChef Junior is a spinoff of MasterChef, but features children as the chefs from ages 8-13. It was also originally a show in the UK titled Junior MasterChef. Gordon Ramsay serves as host and judge for the show, which might sound alarming. Don't worry though, he's not berating the children and calling them donkeys. He calls himself "firm but fair," like a soccer coach. Ramsay seems to have a pretty big heart for the kids. One contestant shared that he only swore twice on set, and never at any of the kids. These kids are seemingly cooking some pretty impressive dishes on the show, but people are constantly wondering just how much of it is fabricated. One thing to note is that there is a culinary team on the show. Not only do they teach the children basic kitchen safety, they also give cooking lessons. These cooking classes teach the kids the most efficient way to cook something, and they also have access to pretty much any cookbook they could want. The kids on Junior MasterChef knew well in advance what they would be cooking, and had a chance to practice preparing the dish as many times as they wanted. They also had private chefs visit their homes to teach them recipes weeks before they filmed the show. One person spoke out after working as a culinary assistant on the show. They confessed that the kids who were chosen wanted to be child stars – not chefs. Most of them were selected to be part of the show because they had a great personality, not because they had any cooking talent. They also went on to say that while you see the kids cutting up and stirring the food, it's the culinary team behind the scenes who are actually doing the real cooking and styling the plates. The kids definitely do use the knives, and tend to burn themselves by accident – that's real! There's even an on-set medic ready in case of any emergencies. They also get help from the crew when they can't open a jar, or reach something from a shelf. We'll let that one slide though, because it's just too adorable. Did you watch the show? Will you still watch it now that you know what you do? COMMENT and let us know! OMG Yes it all set-up! You can tell by who the cameras play on and once, at least, the contestant acted really weird, as if she knew she was chosen throughout the whole thing and sure enough she won - although none of her dishes seemed special. in fact they really never said anything about her dishes, not even a modicum of criticism even when her food looked bad. Very fake indeed. Adults shouldn't do that children. And no I don't watch it any more. so what if it is??????? You shouldn't be saying what you are about children. A friend of mine in NYC had his son audition and he got close to getting on. Is the kid an aspiring chef? No, he is an accomplished child actor (with 2 parents who are also stage actors & make a living at it) Yes he is. Most of the child's work was in theater, so few would recognize him and they liked that- professionally trained acting skills and a not famous face as he had done no national TV yet. They explained they would give him cooking lessons and the kids get help. In effect they wanted him to play a child chef on TV. He is a very cute kid and is a professional actor, he is quite good. He got a part on What Would You Do and he took that instead since it was good money & filmed in the NYC area. He has gotten some national commercials since then too. Are there kids who have skills beyond their years in cooking? Yes, of course, the same as any other talent where some kids are exceptional. The issue is for a show like that the kids also have to be actors and be able to take direction and do what they need to to make a good TV show. Even the shows that feature real professional chefs are staged to an extent- they know what the "mystery ingredient/s" are ahead of time so they can come up with recipes and have the right equipment at hand. I'm an accomplished home cook and can make lots of things from memory as I make them frequently and need no written recipe, but things like beef wellington, lobster thermidor and squab stuffed with homemade sausage are not something most people can make from memory as they are not everyday dishes in my house nor something most people can afford to eat often. I remember the first time I saw the show I knew it was fake. I recognized two of the kids, as they were actoes on TV shows I have watched. Yeah, after watching one episode...in which EVERY 8-year-old produced a 5-star worthy dish in 45 minutes, with no recipe whatsoever.. the show basically screams FAKE. I understand "reality" shows are staged, but some more than others! After researching the topic, come to discover these kids essentially watch actual cooks make these dishes, doing none of the work themselves. Can you say parents bought their way on like the collage scandal? Kids are prepped to the max, it is a big cheat.